The upcoming Hyundai Creta facelift will come with a host of cosmetic and features updated for both the exterior as well as the interior. 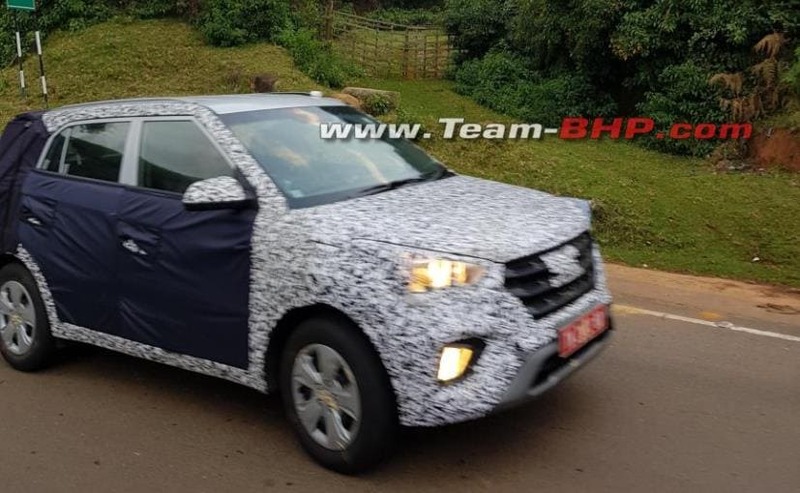 The Hyundai Creta is all set to receive its mid-cycle facelift in India this year and we have more than enough spy images to confirm its arrival. 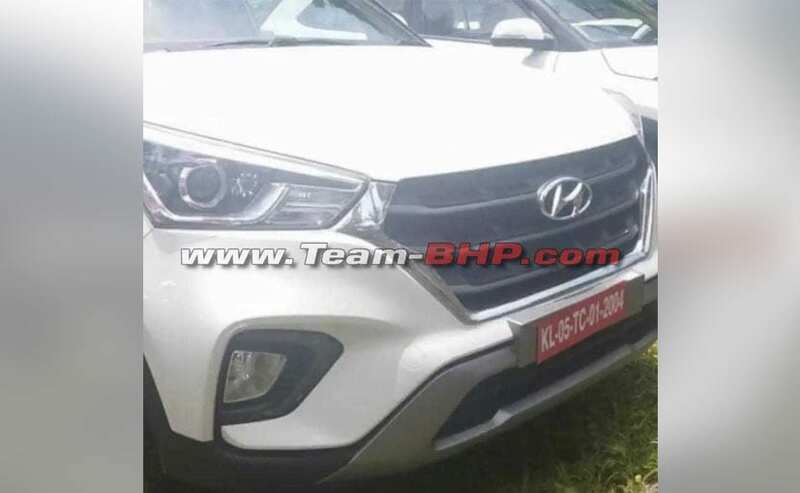 Recently the updates 2018 Hyundai Creta was spotted at a dealership stockyard, indicating that the official launch might happen sooner than we expect. As of now, the SUV is expected to be launched in India in a coming couple of months. We have already told you a fair bit about the 2018 Hyundai Creta Facelift, and here's everything that you need to know. Hyundai first launched the Creta in July 2015 and over the years the carmaker did introduce several feature additions and minor cosmetic update. However this is the first time that the Creta is set to receive its first mid-life facelift, after about three years. The Hyundai Creta facelift will comes with an updated face, equipped with the new cascade grille, revised headlamps with projector lights and LED position lights, LED daytime running lamps, new front bumper with redesigned foglamps and beefier skid plate. The updated model also comes with a new sportier set of 17-inch alloy wheels, however, the mid variant and the lower-spec variants will continue to come with 16-inch alloys and 16-inch steel wheels respectively. Spy images have revealed that the rear portion of the Creta facelift will not see any major changes apart from the slightly tweaked taillamps, and the new rear bumper with fatter plastic cladding, and a larger skid plate. The Hyundai Creta Facelift will be offered in six variants - E, E+, S, SX, SX dual tone, and the top-end SX (O) and will be offered in two new colour options - Passion Orange and Marina Blue. The former will also be offered as a dual tone option with a black roof, while Polar White with a Phantom Black roof option will be carried over from the existing model, along with few existing colour options. The cabin of the Creta facelift is also set to come with a bunch of updates, both cosmetic and features-wise. A recently leaked features list confirms that the SUV will get leather treatment as well, possibly for the top-end models. The dashboard will receive new black treatment with silver accents, orange inserts inside the cabin, and new upholstery with contrast stitching. 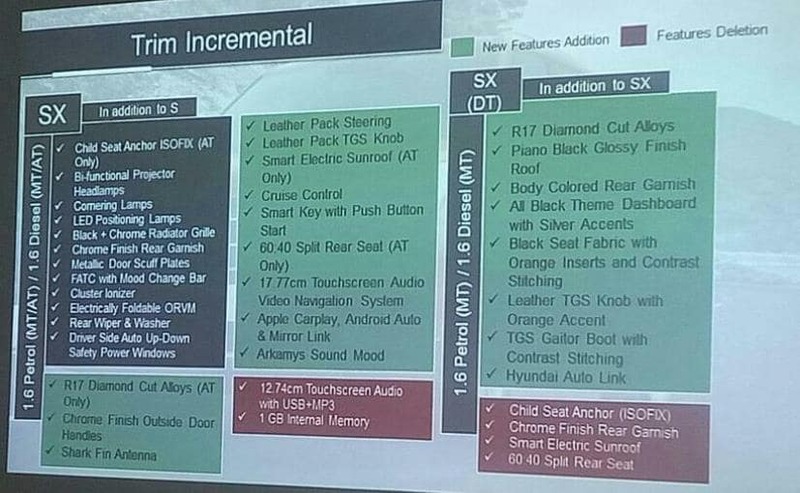 On the features front, the top-end model is expected to come with an electric sunroof, push-button start, larger 7-inch touchscreen system with audio and navigation, Apple CarPlay, Android Auto & Mirror Link for in-car connectivity. On the safety front, the Hyundai Creta Facelift now comes with dual airbags and ABS as standard while the top-end model gets six airbags (including side and curtain). Other features include electronic stability control, hill assist, rear parking sensors with camera, static bending lights, ISOFIX child seat mounts and more. The engine options will remain unchanged and the SUV will continue to be offered with a 1.4-litre diesel, a 1.6-litre petrol and the top-end 1.6-litre diesel engine. While the former will get the option of only a 5-speed manual gearbox, both the 1.6-litre engines will come with the option of either a 6-speed manual of a 6-speed torque converter automatic transmission. Upon launch, the 2018 Hyundai Creta is expected to come with more firepower to compete with the likes of the Mahindra XUV500 facelift, Renault Captur, and even the Jeep Compass.